"As a youth advocate it is hard to move forward, people doubt you-- but it is worse when you're not at the table, because your perspective doesn't get there." 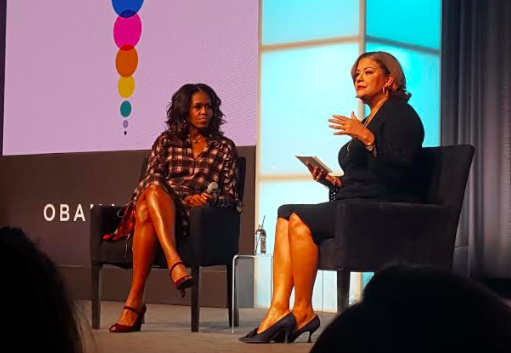 Our own Dean Welliver, Program Associate at South Kern Sol, recently attended the Inaugural Summit for the Obama Foundation in Chicago. Bringing together civic leaders from across the globe for a two-day summit held October 31 and November 1, the summit was packed with panels, workshops, and speakers including elected officials, writers and artists, social justice leaders, and entrepreneurs. “My favorite panel was called ‘Getting Women in the Room Where It Happens,’ which included Dolores Huerta,” said Welliver. 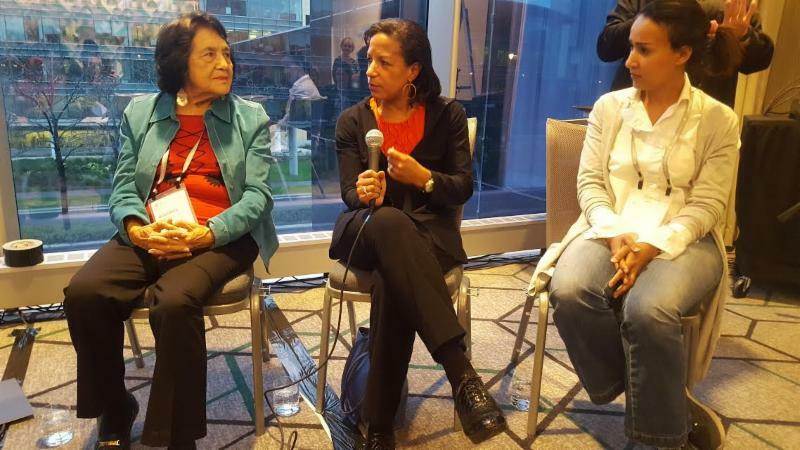 “There were so many good conversations about how women can support women to deal with sexism in the workplace, tokenization, and self-doubt.” The panel included former National Security Advisor under President Obama, and Mana Al-Sharif, the woman arrested for driving in Saudi Arabia. As Program Associate at South Kern Sol, Welliver encourages local youth to find their own voice to raise awareness and visibility of health and race equity issues impacting underserved communities across Kern. Welliver wants to ensure that policymakers and other stakeholders authentically have youth at the table, not just to check of diversity boxes. “I came back feeling extremely grateful to Dr. Ross and the [The California Endowment’s] President’s Youth Council, and also Dolores Huerta, Camila Chavez, and the work of The California Endowment,” added Welliver when asked what was his greatest takeaway from the summit. Read more and watch streams of the speakers at the Obama Foundation Inaugural Summit here. Don’t miss the unique opportunity to watch Dante Alencastre’s Raising Zoey on the big screen in Bakersfield. The documentary, follows transgender rights activist Zoey Luna as she struggles with acceptance at school. A panel discussion will follow the film. The screening will be held Wednesday, May 17 at 6 p.m. at Maya Theatre, 1000 California Ave., in Bakersfield. To reserve your free seats please click here. Kern County Public Health Services, in collaboration with Building Healthy Communities-South Kern, California Rural Legal Assistance (CRLA) and Kern County Library, invite you to the Language Access Workshop. This workshop is a follow-up event to the Language Access Convening held on November 9, 2016. The workshop, like the convening, will focus on the Indigenous Mexican community living in Kern County. Indigenous communities from Mexico speak distinct languages that bear no linguistic similarity to English or Spanish. Discuss next steps toward achieving short and long-term solutions. Please fill out this registration form below or use this link (https://goo.gl/forms/OS7mCaAXGu5OqWty1). The workshop will be held May 11 at Bakersfield’s Beale Memorial Library, 701 Truxtun Ave. from 1:30 p.m. to 4:00 p.m.
A #HealthyKernCounty benefits us all. Please send us a message to learn how you can get involved. Please join us on May 11 for a special screening of Ana DuVernay’s new film, ’13th,’ which takes an in-depth look into our country’s prison system within the context of this nation’s history of racial inequality. A panel discussion will follow the film. The event is free to the public, but people must register as space is limited. Please register here. Youth leaders from South Kern Sol, community organizations, residents, and local businesses will be launching this year’s Social Justice Series on May 1 with a march and rally starting at 10 a.m. at Mill Creek Linear Park. The event will encourage civic participation and encourage residents to become outspoken advocates and #Resist attacks against our vulnerable communities. There’s a new skate park in Arvin, and skaters from all over the area have been breaking in the state of the art park that was finished last week. The skate park has plenty of spaces to grind, thanks to dozens of young leaders who gathered signatures, received input from members of the community and presented plans to the city. The action park, which has both skate and bike-friendly features, will attract more Arvin youth to “stay engaged, healthy, and off of the streets,” according to Kahler. Building youth leaders and creating safe places for youth is one of Building Healthy Communities South Kern’s priorities. City leaders say this park is an example of how community organizations can work together with local government to help build youth leadership. “The new skate park will be a great asset for our community and will serve as proof that when we work together, engage our community, and make bold decisions, we truly have the power to make our vision for Arvin a reality,” said Arvin Mayor Jose Gurrola. Community leaders say the park will eventually have a positive health impact on the environment of the whole city. “This skate park will give kids a healthy activity, attract economic development and ultimately improve the quality of life for the entire community,” says the mayor of Arvin, Jose Gurrola. The skate park was made possible thanks to a partnership between the City of Arvin, Bike Bakersfield, Tony Hawk Foundation, Mountain Side Disposal, and Building Healthy Communities South Kern. “This project starts to answer some of the needs and desires of our community. It brings together healthy initiatives by promoting physical activities in a safe environment. This project reflects the real results of a community-wide transformation process to improve the quality of life in Arvin,” says Alfonso Noyola, City Manager of Arvin. The skate park is located at DiGiorgio Park, 699 Haven Dr. in Arvin. Committee for a Better Arvin, Comite Progreso de Lamont, and Center on Race Poverty and the Environment (CRPE) reached an agreement with Recology over the company’s new operation of Recology Blossom Valley Organics, a composting facility outside of Lamont. “This agreement signifies a new beginning for the residents of Lamont and Arvin in terms public health and safety, and a partnership between Recology and the local community,” wrote CRPE in a press release. The community agreement will ensure the operation is safe, protects public health, and also makes significant financial investments in the community. The history of relationships between economically disadvantaged communities and industrial corporations is often one of conflict. This win is an example of how corporations can work together with residents and why it’s important that corporations engage community residents into business processes. 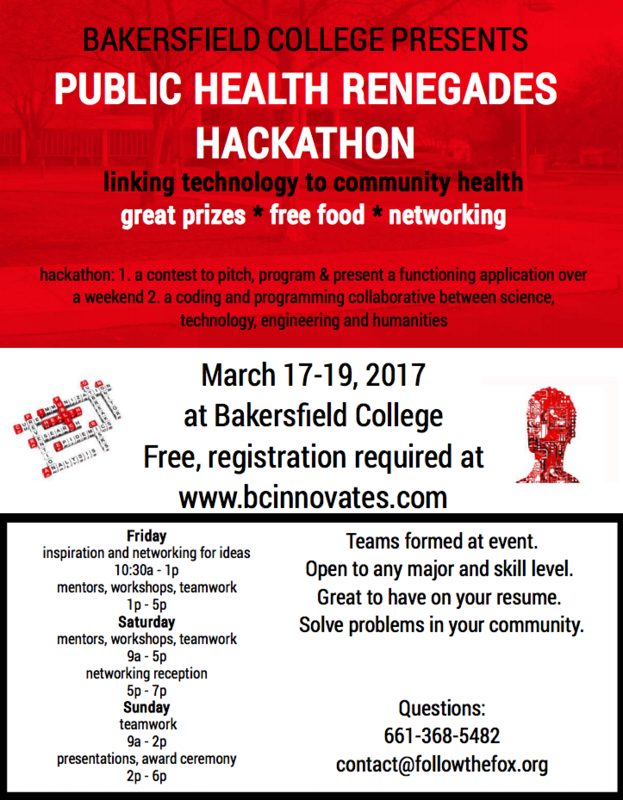 We are proud to announce that Building Healthy Communities South Kern is sponsoring Bakersfield College’s Public Health Hackathon, an event that will bring together public health and science students to develop solutions to community health challenges. One of the challenges that will be poised to students is the need for a Building Healthy Communities South Kern application, so that partners can be connected and communicate in real time. The free event takes place March 17, 18, & 19 at Bakersfield College, 1801 Panorama Dr. in Bakersfield. Participants interested in collaborating can sign up for the hackathon at bcinnocates.com. For more information, please call Allyssa Haas at (661) 368-5482. Public health officials, community leaders, churches, and residents launched an educational campaign about the human and economic impacts of the Medi-Cal expansion. The campaign was launched early this month and includes billboards, radio spots and print ads in the Bakersfield Californian. Our public agencies are already facing slashed budgets–an additional $305 million would be eliminated from Kern County’s economy. People would lose their jobs–about 4,000 jobs in health care and other industries will be lost. Our shortage of doctors, nurses, and other health professionals would be made even worse. Our local hospitals are finally being paid for the care they are providing–a trend we want to maintain. More than 95,000 residents would lose coverage, leaving them with no support when illness, injury or accidents occur. Join our campaign. Send us a message to learn how you can work with us.